Have you ever fallen into the droopy-sleepy-yawny-have-no-energy trap? When both the middle of the morning and the middle of the afternoon feel like bedtime? Ugh. I have. Back when my breakfast consisted of mainly grain-based cereals or processed and refined breakfast pas- tries. Add to that a cup or two of sugar-sweetened coffee in the morning and a couple of corn syrup–sweetened caffeinated beverages in the afternoon, and I was left with a roller coaster of inconsistent energy levels. All of that changes when you started avoiding refined sugars and processed and packaged breakfast foods. Dips in your energy evens out into one steady stream of reliable energy. What a difference a consistent pep in your step makes! I contemplated naming these “All Day Energy Muffins,” because these moist morsels give you wings—more so than any energy drink I’ve ever tried. 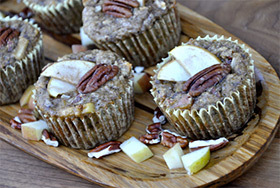 Check out the ingredients and you’ll see what I mean: flax, almonds, eggs, banana, apple, pecans—I doubt you could find a muffin recipe with more goodness crammed into it than this. No really, don’t waste your time looking—just make these and enjoy! Preheat the oven to 400°F. Line 12 muffin cups with paper liners and set aside. In a large mixing bowl, combine the flax meal, almond meal, baking powder, baking soda, sea salt, and cinnamon. Mix well. In another large mixing bowl, combine the eggs, raw honey, and mashed banana. Mix well until no large lumps of banana remain. Add the dry ingredients to the wet and mix until fully combined. Fold in the chopped apples and pecans. Fill each muffin cup three-fourths full. Top with an apple slice and a pecan. Bake for 18–20 minutes, or until golden and set. Let the pan cool for 5 minutes, then transfer the muffins to a wire rack to cool. 145 calories, 10g fat, 11g carbohydrate, 6g sugar, 318mg sodium, 3g fiber, and 4g protein. IF THESE TIMES ARE NOT GOOD FOR YOU PLEASE CALL AND WE CAN SET ONE UP!